Don't Let Lingering Pain Hold You Back – See Us for a Second Opinion! It can be downright frustrating when you went to see a doctor hoping to have your problem resolved and then, even after surgical intervention, you are still having pain. Austin Foot and Ankle Specialists may be able to help! At our practice, we’ve been able to treat many patients who had gone elsewhere for treatment—conservative and/or surgical—but were still having issues. Ultimately, they were able to find the relief they were seeking for one simple reason – they came to see us for a second opinion! Of course, it’s always a smart move to get a second opinion before treatment for a medical condition, and especially if the recommended course of action is surgery. There are two key reasons: 1) you want to make sure the diagnosis is correct and 2) we may have other treatment methods available that give us more options in how to fix your problem. With regard to the first point, the fact of the matter is doctors are only human. It is possible your treating physician or surgeon has missed something we will catch for you. This could potentially prevent you from undergoing a procedure that is wrong for the situation or doesn’t even need to be performed! As noted, we also may have additional options. One of our commitments at Austin Foot and Ankle Specialists is to staying on the forefront of podiatric medicine. We keep up with the latest techniques and have state-of-the-art equipment and products at our disposal. Put simply, we very well could have a better treatment option for you. Beyond those two reasons for seeking a second opinion, there’s really no risk to you. Even if you come to us and we agree with the initial diagnosis and treatment plan, you will feel reassured and confident knowing the path forward is a good choice. If you didn’t seek a second opinion prior to your surgery, and now are still experiencing lingering, chronic pain afterwards, you can still come see us for a second opinion. We will review the initial condition and procedure performed, and then assess your current condition to create a treatment plan to resolve the problem for you. You needn’t worry about contacting us for a second opinion – many patients do this and we have been able to help them. There’s a strong possibility we can do the same for you! 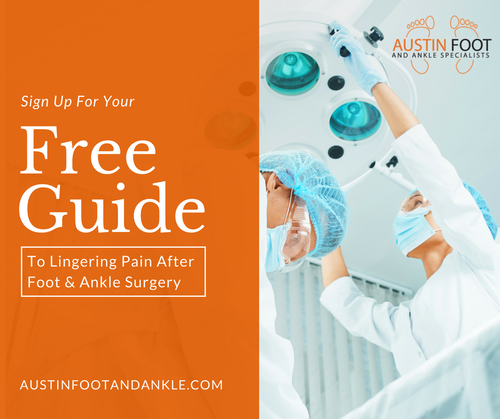 You’re ready for a second opinion, you’ve downloaded our free guide, and now your next step is to contact Austin Foot and Ankle Specialists. Have our expert team provide a second opinion or, even better, come see us in the first place for the effective, quality medical treatment you deserve! Call us today at (512) 328-8900 for more information or take advantage of our online form to connect with us right now.